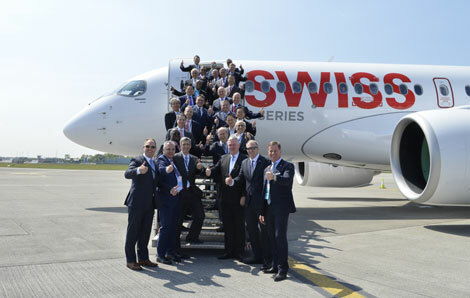 Bombardier has carried out the first passenger flight of its new CS100 aircraft, ahead of its delivery to launch customer Swiss later this month. The demonstration flight carried Star Alliance CEOs, executives and media between Dublin and Zurich, at the end of the annual International Air Transport Association (IATA) AGM. According to Bombardier “The one hour and 50 minutes ride from Dublin to Zurich consumed 20 per cent less fuel than competing single-aisle aircraft currently flying that route”. “It was a pleasure to welcome our fellow Star Alliance Chief Executive Board members to Zurich in this special year, having flown on a very special aircraft – the Bombardier C Series – for which Swiss is the launch customer. The C Series comprises two models – the 110-seat CS 100, and the 135-seat CS300. Customers include Swiss, Delta, Gulf Air, Korean Air and Air Baltic.